The brain is one of the body's vital organs, required to process thought, coordinate motor function, and perceive the world around us. Despite the significant amount of research that has been performed, brain injuries remain a serious matter. If the brain stops working, a person is termed "brain dead." Furthermore, non-fatal injuries to the brain are often permanent and can cause an individual and their loved ones a large amount of hardship. For this reason, traumatic brain injuries are always a serious matter. Traumatic brain injuries (TBIs) must be diagnosed and treated quickly to ensure that anyone suffering this injury retains as much of their brain function as possible. Any delay in recognizing the injury can lead to the loss of valuable brain tissue, possibly resulting in permanent disabilities; however, prompt recognition of the symptoms of neurological damage can lead to rapid intervention and, possibly, a quick return to baseline. Anyone who has developed any of these symptoms needs to seek medical attention to have a full diagnostic workup to ensure that they do not have a serious brain injury. Rapid treatment can help to minimize the damage to brain tissue. CT Scan: A CT scan can be thought of as a continuous x-ray. Whereas an x-ray generates an image in two dimensions, a CT scan will generate a similar picture in three dimensions, helping to paint a more accurate picture of what is going on. 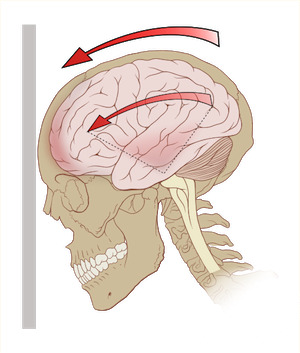 A CT scan is exceptional at looking for bleeds in the brain and at picking up bone fractures. It is a relatively quick scan; however, it is not as strong at identifying soft tissue injuries and uses a significant amount of radiation to produce its image. MRI Scan: An MRI is a detailed scan that produces a brilliant picture of what is happening in the brain of an individual. It uses powerful magnets to produce its image and is much better at looking at soft tissue structures than a CT scan. Furthermore, it does not require any radiation, a large advantage over a CT scan. On the other hand, it does take much longer to complete this scan, meaning that it typically is avoided under emergency circumstances. Once the patient has been diagnosed, treatment can be started; however, the medical side of a brain injury is only one of many different issues a family will have to deal with. Surgical Treatment: Many patients will require surgical care to help relieve swelling, bleeding, or clotting that has developed in their brain. Even if insurance covers these procedures, the deductible and coinsurance can be substantial. Lost Income: Many brain injuries will take months to recover from and some employers could refuse to pay someone's salary after all of their vacation time has been used up. What is a family to do without a paycheck? Rehabilitation: An often-overlooked source of financial stress is the rehab appointments that come after a patient has been discharged from the hospital. Many insurance providers will not pay for these appointments, yet they are vital for helping someone return to their baseline. Anyone with questions should reach out to a caring, compassionate, and experienced Manteca injury lawyer lawyer today. Nobody should have to deal with this stress on their own. I’m Ed Smith, a Manteca Brain Injury Lawyer. If you've been injured in an accident, call me for free, friendly legal advice at (209) 227-1931. I am also a proud member of the California state section of the Million Dollar Advocates Forum, an organization comprised of attorneys who have achieved verdicts and settled cases valued at $1 Million dollars or more for their clients. Many of our members have been ranked alongside some of the country's top trial representatives. Visitors can learn more about my office with helpful reviews from earlier clients, available on Yelp, Avvo, and Google. To review my office's earlier verdicts and settlements, click here.